Many insects are ground dwellers. Image: Some rights reserved by nebarnix. In celebration of National Pollinator Week, I was preparing to write this blog posting about some of my favorite native plants for pollinators. You know, things like New Jersey tea or goldendrod. There are a many critical sources of pollen and nectar for our native bees and other pollinators, but I thought it would be fun to talk a little bit about another crucial component of pollinator support: habitat. Many of our native pollinators do not nest in native plants, even if they use them for food. So maintaining areas in your garden for these critters to nest is very important. In many cases, the best habitat is bare, dry soil. 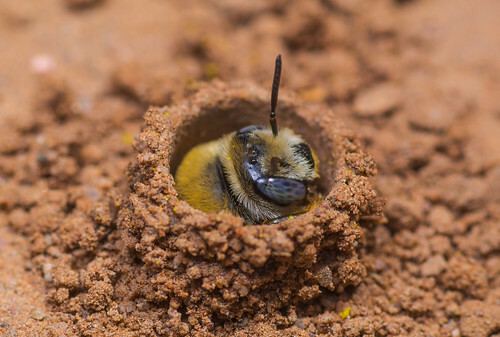 Many insects are ground dwelling: they burrow tunnels into bare soil to create space for reproduction and hibernation. While these bees may push through a thin, loose layer of leaves they might avoid heavily mulched areas. Leave plenty of space in your garden where bare soil (possibly lightly shaded) is tolerable. Then tolerate it. 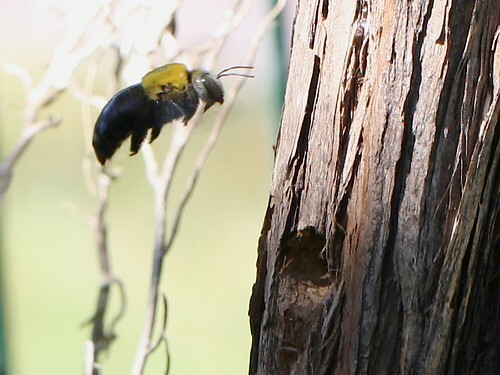 Carpenter bees will nest in dead wood. Image: Some rights reserved by Malcolm NQ. Many other bees will nest in dead tree limbs. Carpenter bees are one of the most common wood-nesting bees in my area: every year, they burrow into the underside of my front porch railings. But they will also find homes in standing snags, undisturbed piles of firewood, and the like. Native plant gardeners often focus on the native plants, but other factors make for a successful wildlife garden. Earlier, Heather Holm wrote about creating nesting sites for mason bees and Beatriz Moisset wrote about the wintering habits of pollinators. Additionally, both the Xerces Society and the Pollinator Partnership have great resources on all aspects of creating habitat for pollinators. The best way to get started is to simply start! A comprehensive site visit is just $175. Need expert advice in selecting and sourcing native plants for your design project? Looking for help setting up a new native plant nursery? Are you looking for ways to increase your sale of native plants, or perhaps even startup your own native plant nursery? Let us save you time and money by applying years of experience in running a growing and profitable native retail business. When it comes to choosing native plants, you want advice that is based on years of experience and the most up-to-date ecological science. Expert site visits start at just $175. Book a visit today. You have questions about how NativEcology can help you strengthen your retail business or help you design your native planting? We will provide an expert and custom solution. Just let us know how we can assist you.